Lost in the flurry of free agent activity has been an under-reporting of the importance of Carl Nicks to the Saints' signing of free agents and re-organization of their salary cap. The future of Nicks as a Saint remains somewhat uncertain. He's a restricted free agent, and tendered with a 1st round compensation. Basically, this means that if (when) he tests free agency this summer and if he signs an offer sheet with another team, then the Saints must match that offer if they want to retain Nicks. If they don't match the offer, the Saints will receive compensation in the form of a future 1st round draft pick from the team that potentially signs Nicks. Easy enough, right? Considering that Nicks is young and is entrenched in the elite class of guards in the NFL, it seems almost certain that some team will throw a boatload of money at him in the coming week. If the Saints intend on keeping Nicks for the long term, they'll need to pay top dollar for his services. Considering that Jahri Evans recently signed the richest deal in league history for a guard, and further considering that Drew Brees is due for a monster contract within the calendar year, there's only so much money to go around. With that being said, I can't see the Saints letting Nicks get away from them. Protecting your chief investment--Brees--is paramount and the Evans/Nicks guard combo does just that, and does it spectacularly well. Assuming that Nicks will ultimately sign a rich contract with the Saints (I'm assuming this), it hinders the Saints' ability to sign their various free agents now. It's a simple ripple effect. When you consider the large number of free agents the Saints currently have (nearly 30), you realize that many of the pieces of the 2009 championship team just won't be around this year. 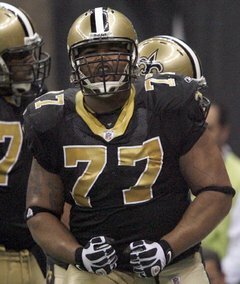 Further, with priorities like Jermon Bushrod, Roman Harper, Lance Moore, Jonathan Goodwin, Dave Thomas, Reggie Bush, Zach Strief, and Darren Sharper, it's likely the Saints will be forced to underbid on several of these players in an effort to manage the salary constraints in regards to both the immediacy of their needs and in regards to Brees and Nicks, as discussed above. Of the players listed directly above, the priority signings, in my opinion, are Bushrod and Harper. And then Lance Moore. It's much too risky to go into 2011 with a question mark at LT, a position of vital importance, especially considering the Saints have legitimate Super Bowl aspirations. Signing Bushrod to handle the left side of the line for 2011 is an absolute must. As for Harper, he's been shredded by Saints' fans in the aftermath of the Saints' 2010 playoff loss to the Seahawks. And while Harper has deficiencies in pass defense, he is a two-time Pro Bowler and one of the Saints' most consistent defenders during the Payton era. He's also exceptional against the run. Combine this with the fact that the Saints are perilously thin at the safety position, and it means that re-signing Harper is essential. While Lance Moore is a personal favorite of mine, and a favorite of almost all Saints' fans, re-signing him is less of a priority when you take into consideration the entirety of the Saints' immediate needs and salary restraints. Without question, Moore is an outstanding WR. But with the diversified, socialist philosophy the Saints' offense espouses, I can't see the Saints offering top dollar to Moore. Remember, the Saints rattled off a 13-3 season in 2009 largely without the services of Lance Moore. That's not to minimize his abilities or belittle his contributions; it's just a reminder that on the Saints' offense, the only one critical component is Drew Brees. I do believe both the Saints' front office and Drew Brees badly want to re-sign Moore. But I also believe Moore is looking for a big payday, as he's outperformed his prior contracts and likely wants to maximize his earning power, as he should. He deserves a requisite payday. Unless he's willing to accept, say, 80-85% of what some other team may offer him--and I'm assuming some other team will make him an attractive offer--I sense he'll play elsewhere next season. But let's hope not. As the next few days of free agency unfold, the Carl Nicks' situation bears watching closely because, in my opinion, his fate is the domino that dictates the difficult decisions the Saints' front office faces.